The S&P 500 Index has recovered all that was lost in the two day selloff following the Brexit vote. Since the Brexit low, the S&P 500 Index is up over 8.5% and this has taken the index out of its 18+ month trading range. As the below chart shows, the trading range goes back to the end of 2014 and up until this week, the only breakout from the range had been to the downside. With this strong recovery and range breakout, some of the technical indicators are indicating the market looks overbought. 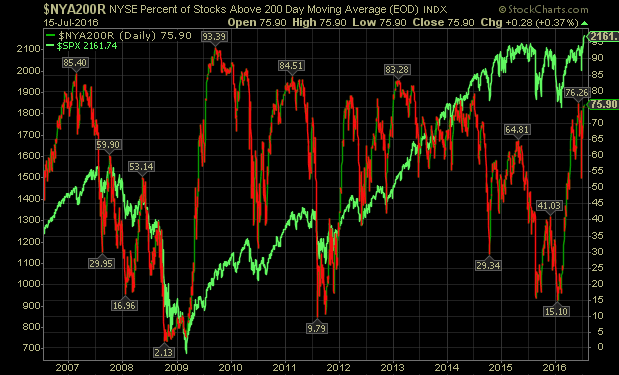 The next two charts show the percentage of NYSE stocks trading above their 50 and 200 day moving average. In the case of the 50 day moving average percentage of 80.9%, this is approaching levels that historically coincide with market tops. 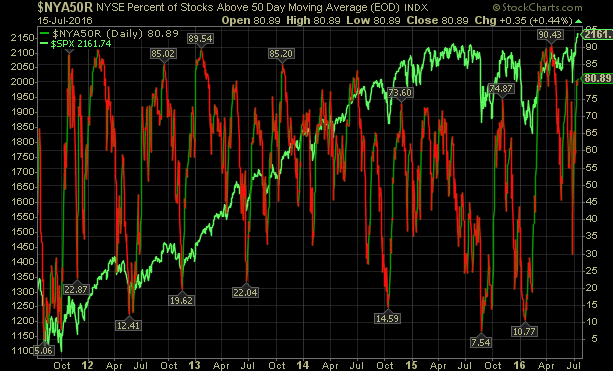 Although the percentage of stocks trading above the 200 day moving average is also high, it is not at peak levels that necessarily are indicative of a market high. 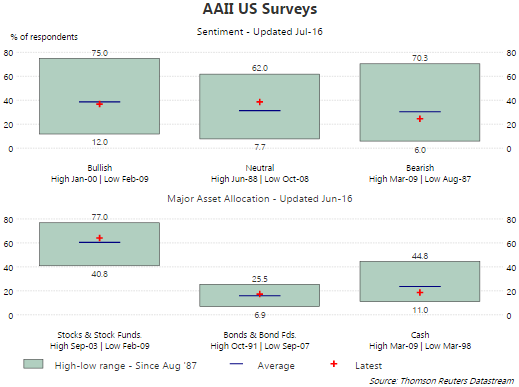 Our best case view is the market will trade higher over the course of the next twelve months; however, a near term pullback and test of the prior range resistance level around 2,134 is likely and would be healthy for the market. 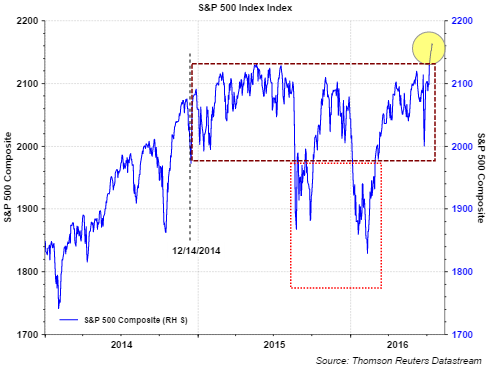 For the market to continue to move higher, corporate earnings will need to continue showing improvement. As we have noted in a couple of earlier posts, this seems to be occurring. To date Thomson Reuters reports, 36 companies in the S&P 500 Index have reported Q2 2016 earnings and the beat rate of 64% is slightly better than the long term average beat rate. Also, the negative guidance to positive guidance ratio of 2.2:1 is better than the 2.7:1 ratio that goes back to 1995. 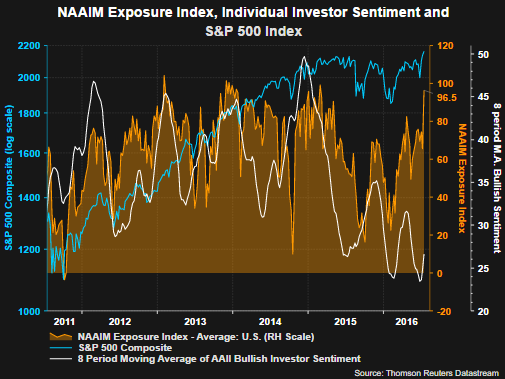 We believe earnings have bottomed and are beginning to return to growth. However, the speed and magnitude of the market's recovery from the Brexit is such that some consolidation/pullback is likely, but would be a healthy occurrence.